1 Usually people don't think of wild beasts and art at the same time. But one art movement was named for wild beasts. This art style was called Fauvism. 2 Fauvism started in France. It only lasted a few years. 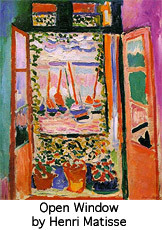 The first person to paint in this style was a man named Henri Matisse. He liked to use bright colors, especially red, blue, and green. One famous painting he did was called Open Window. In it, he painted turquoise skies and pink ocean waves. The art critics were shocked when they saw his weird colors. After all, who ever heard of a pink ocean? No one else painted like that. They called Henri and his friends "fauves" which is the French word for wild beasts. They said that the room where the paintings were displayed was a cage!